As the icy wind blew snow along the pavement like sand through a frozen desert, I walked into Bløm Meadworks. It was just after hours, but the promise of good music had drawn a modest crowd of around 30 people. After beer and wine was distributed and the audience settled into their seats, they killed the lights, and we were suddenly thrust into a warmth and calmness that rivaled even the most roaring of hearth fires. The red and blue glow of smaller lights along the wall and the low hum of the brewing vats beside us made the blizzard outside feel a million miles away. The concert featured three vocalists: Rebecca HH Rosen, Jocelyn Zelasko, and Hillary LaBonte. Rosen is a singer-songwriter who tours all over the U.S. with various groups; a musical vagabond since 2014. Zelasko and LaBonte are contemporary classical singers, taking part in various operas. All three have immensely strong voices with tones and ranges that are quite unique from each other. The music from Rebecca HH Rosen and the cellists made me feel such conflicting things at once I became stuck in a tight space, held by the sound, feeling secure and claustrophobic both. Though the songs made me automatically picture peaceful summer images of the sun and breeze and soft, long grasses, I cried through the entire 30-minute set. And it wasn’t as if I began to listen and take in the words, gradually tearing up at the beautiful intersection of voice and my favorite string instruments. No more than five seconds passed from the moment Rosen began singing and I felt tears hitting my cheeks. There was nothing sad about the experience; all at once I felt all that is good and beautiful in the world, every sunny day. The sound of the cellos, guitar, and voice was simultaneously impossibly smooth and strong and sweet. I regret that I could not pay much attention to the lyrics, most of which were written by Rosen herself. 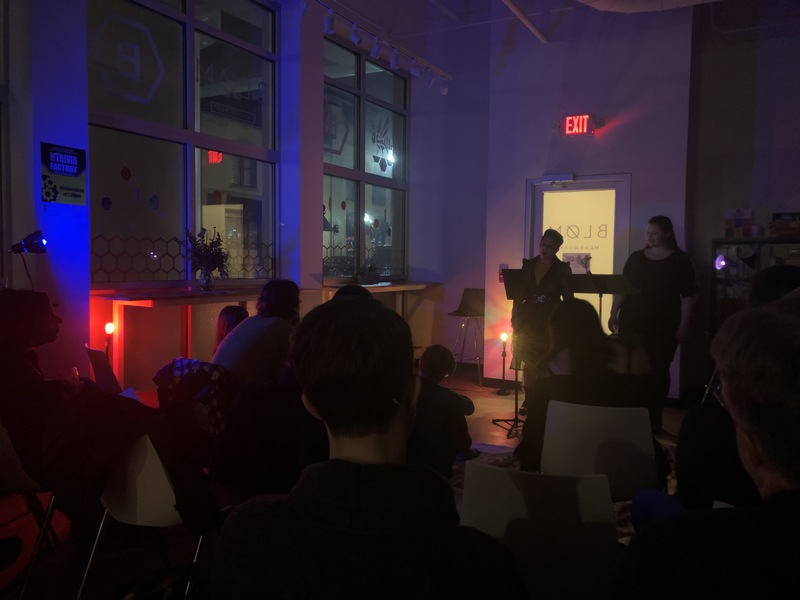 The next singers, Jocelyn Zelasko and Hillary LaBonte, performed together in what proved to be the most wildly conflicting, experimental version of chamber music I have heard yet. 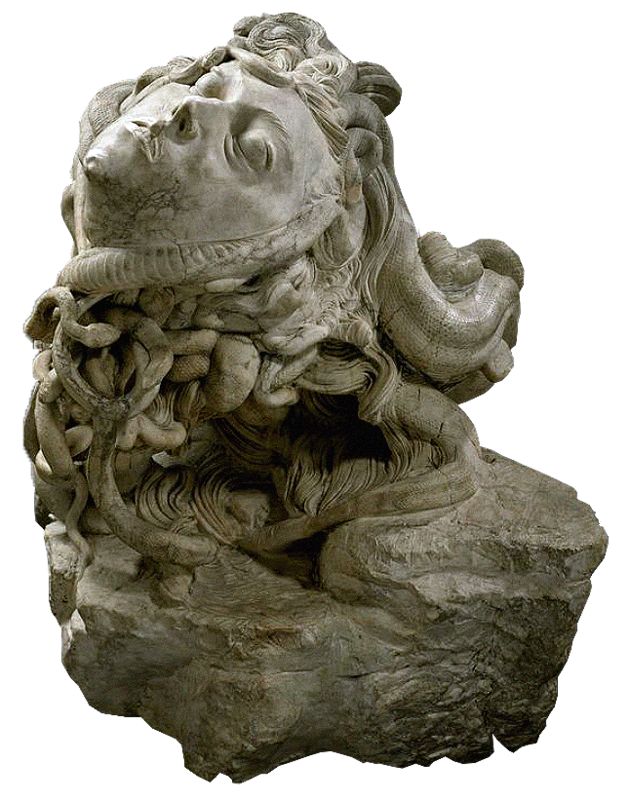 Though maintaining a classicality that stretched into opera at times, much of their performance was illogical, though it provoked critical thinking. A few songs had no words at all, but were piercing and emotional enough to stay in my memory for days afterwards. This may have been the effect of the room’s odd lighting, but I swear I lost my sense of sight for a time, LaBonte’s hair and face melting together with her neck and shoulders. I do not have a clear idea of what this fleeting semi-blindness means. The last part of their set used audio description as a medium–they literally put headphones on and described the sounds their phones were playing. It sounds ridiculous and confusing, but it felt like something more. When combined with the wordless songs and the often irrational ramblings of ones with lyrics, I had a sense of reliance on the singers for information, on the stories they were piecing together for us. It was reminiscent of ancient oral storytelling traditions; I was grateful to gather and understand the details they were passing down. This concert was just one in Bløm Meadworks’ Third Place Concert Series. The series features a wide variety of artists in a wonderfully-curated monthly event. 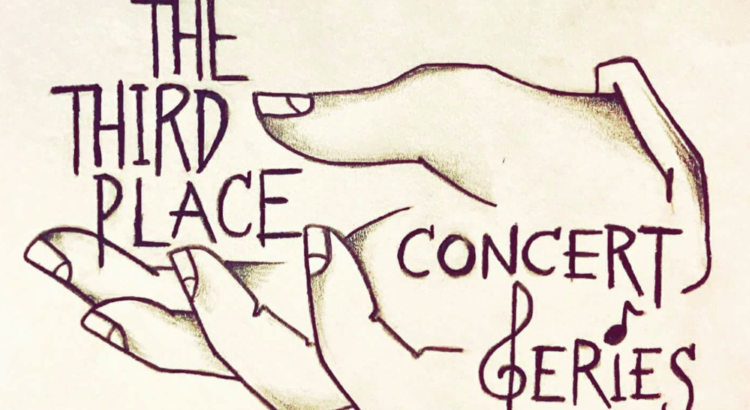 Check their Facebook page (https://www.facebook.com/TheThirdPlaceConcertSeries/) to look for future events. 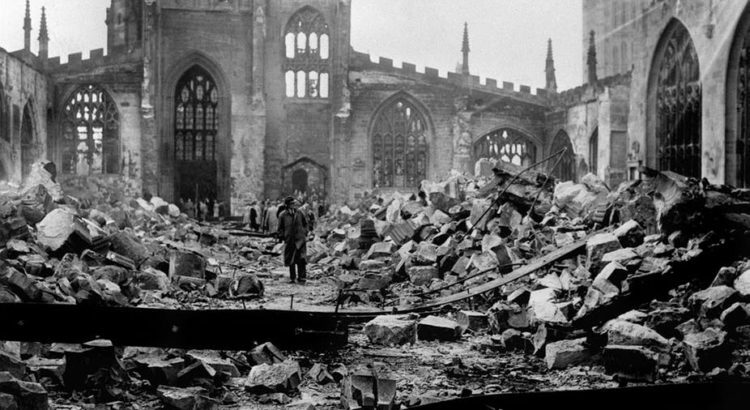 Benjamin Britten’s War Requiem was commissioned for the re-consecration of Britain’s Coventry Cathedral, a beautiful church tragically destroyed in a World War II bombing. Britten himself was a staunch pacifist who had registered as a conscientious objector during the war, and the unique combination of these two elements gave birth to a piece that cuts through the gloss of glorified war stories into the more complex, tragic truth of the raw destruction of war. The text of the 80-minute choral piece is assembled from the Latin Mass for the Dead and the poems of Wilfred Owen, a World War I soldier who was killed just a week before the armistice at the young age of 25. Owen’s poetry is plainly anti-war, and the first of his lines in the piece is the chilling “What passing bells for these who die as cattle?”. The requiem was presented as the collaboration between the Ann Arbor Symphony Orchestra, the UMS Choral Union, the Ann Arbor Youth Chorale, as well as three vocal soloists. The addition of the children’s chorale as specified by the original work adds a uniquely haunting aspect to the piece, a reminder that war ultimately results in a great deal of innocence lost, and the sacrifice of young lives with full futures ahead. Britten alternates between dissonant chanting mixed with layers of percussion and smooth, lyrical passages as the piece glides from movement to movement. Yet throughout the entire piece, the atmosphere is solemn, almost haunting. Britten refuses to let the audience forget why the piece was conceived, as a response to a tragedy brought about by the senselessness of war. It is impossible to hear the words of Owen echo through the auditorium in the rich tenor of soloist Anthony Dean Griffey without feeling an acute sense of what we have lost to the cruelty of war. Owen himself was a poet who garnered an abundance of post-humous acclaim despite his short career and the few poems he wrote; his career was brought to an abrupt end by a premature death on the battlefield. Owen is merely one of many young talents, or simply young people, or people in general, whose lives were stolen from them by the merciless combat between sides. War Requiemserves as a haunting reminder that war is not a necessary evil, nor is it one we can afford to distance ourselves from. In the United States, it is perilously easy to turn a blind eye to those suffering from wartime brutality in other countries and in the modern age it is perilously easy to designate war as a “necessary evil”, a tragic yet inevitable byproduct of civilization. Yet as Britten wants us to remember, in a society as advanced as ours, the fact that we have accepted senseless violence over superficial causes as the price of civilization ought to haunt us, and we ought to remember that we have more power over our fates than we like to admit. The Book of Mormon was a wonderful production, put on by Broadway in Detroit at the Fisher Theatre. It is undeniable that the stage was almost glowing throughout the entire show. The bright lights and set decor were a defining part of the experience, giving it the livelihood that such a musical, with compelling identities and enthusiastic characters, deserves. The vibrant colors of the costumes further complemented these strong production aspects, while also playing well into building the separate identities of the characters. The animated performances of the cast were obviously doing the heavy-lifting. Between the identifiable characters, the strong choreography, or the catchy, witty tunes, the cast managed to bring life to the entire show. For people who are unfamiliar with the show, here it is: two 19-year-old mormon missionaries, Elder Price and Elder Young, are sent out to Uganda for their first two year mission, and it’s not what they expected. Price had hoped to be sent to Orlando Florida, and follower Young just wanted to be Price’s sidekick – but instead he ends up converting many Ugandans on his own terms. Through their adventures with religion, culture, and interaction, the show expresses satire, and sometimes even deeper emotion. My favorite parts of the show would have to be the songs “Baptize Me” and “Joseph Smith, American Moses” and the choreography. In the former, Elder Young goes through the process of baptizing Nabulungi, which is full of sexual implications. I think I loved this one because Young is such a charismatic character – he brings many laughs to the show, while also forcing the audience to empathize with him because of his low self-esteem. In the latter, the villagers put on a show for the Mormon missionaries, which is entertaining thanks to the juxtaposition between the Ugandans and the Americans reaction. The choreography is a major part of the show, paying tribute to all different genres and parts of musical history. Such complexity and variety from song to song is refreshing, fun, and completely classic. I guess it’d be foolish to expect anything but hyper-theatricality, even if it is a show focused on Mormons in Uganda. The only issue I had with the show was, well, the show. I knew that it was somewhat controversial, but generally hailed as a brilliant production. However, as I sat through the first act, it took me some time to warm up to the jokes and feel comfortable with them. This is not because I don’t like or am not used to comedy – I love it. And beyond that, find it to be an extremely effective means, specifically when battling confusing identities, ones that are often stereotyped or oppressed. Comedy is awesome. But for some reason, the portrayal of the Ugandans, an imperative part of the show, was not cutting it for me. And despite having thought and read about the story, I still cannot put my finger on what exactly turned me off. It could be due to the current climate our world is in – one where outlandish, seemingly ridiculous ideas that appeared and functioned as jokes are finding their footing in societies that are supposed to be increasingly “progressive” and “forward-moving.” It could be a variety of reasons, objective or subjective. I’m toying with ideas here, still trying to understand why I didn’t love my matinee musical experience quite as much as I hoped that I would. Instead I’ve been left as a slightly confused google-searcher and review-hunter. However, I saw that by the second act, as a whole, the Ugandans were more humanized and credible. They knew that everything Young was spewing to them, about kissing frogs to cure AIDS and yatta yatta, was metaphors. And by the end of the show, we’re on a positive note again, just as hopeful as Elder Price was at the beginning when he hoped to be sent to Orlando, acknowledging the importance of religion and beliefs to many people, no matter their differences. All in all, I’d say The Book of Mormon is a put-together production worth seeing, and one worth taking a more critical look at, too. It’s amazing the little worlds we discover throughout the course of this life. I’d never thought that the flute could stand so tall as a solo instrument, instead of a part of an orchestra or a marching band. But its soaring, cascading voice held a truth deeper than I had thought was possible. The flute is far more nuanced than it seems in a sweaty middle school gym while performing with the school band. 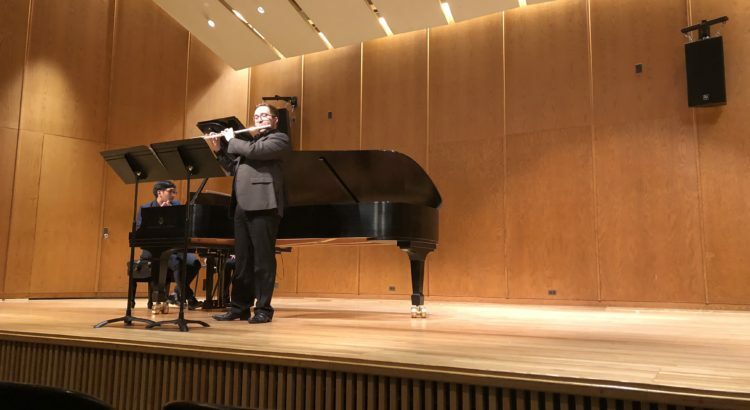 Far from being the out-of-tune, squeaky instrument students and their parents grew to hate, Jordan Smith’s recital was moving. He pushed past the limits of the sound barrier like it was nothing, pulling out sweet music from only the air. 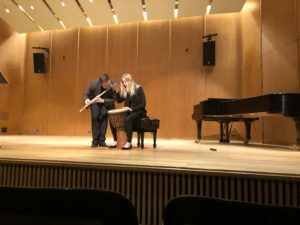 But the performance was not your standard recital; though it began with Mozart (whose brilliance at age eight makes me incredibly jealous), it dove into the contemporary, first paired with the standard piano, then percussion (drum, clapping, sticks), then a wondrous video of life emerging from a fallen tree. Smith brings life and youth to what is more commonly the property of old folks ancient enough to have known Mozart personally. If I had to say anything negative about his performance, it would be the occasional loudness of his breaths in between long musical phrases. This is understandable given the air required to play these passages, though I must admit the sound did distract from the melody quite significantly. There were a few things out of his control that were less than desirable. The first was a technical difficulty that mangled the audio of the video that was projected behind Smith as he played (though his show-must-go-on attitude and beautiful timing still allowed the video to play a part in the performance). Secondly, all of the selections that incorporated percussion repeated the same tune of a few beats over and over. A livelier, more varied beat could have worked well with the flute’s melody. I assume Jordan Smith started playing quite young, by middle school at least. Seeing him perform at the level he does now, it is almost impossible to imagine his own off-key first foray into the band geek world, torturing his parents with hours of painfully bad practicing in his bedroom, obligating them to attend all of the soul-crushing school performances. 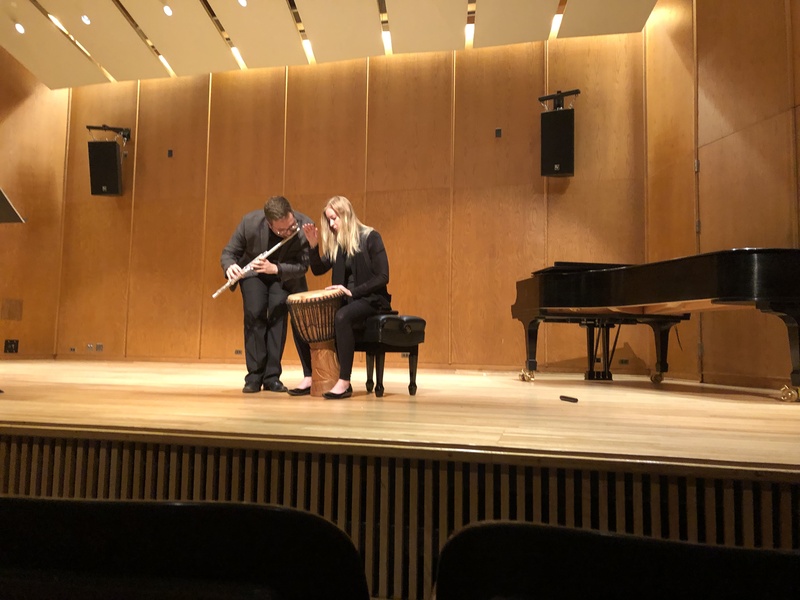 For most of us, the end of the flute road comes with middle or high school graduation–most of us don’t have the dedication it takes to develop talent like Smith has. 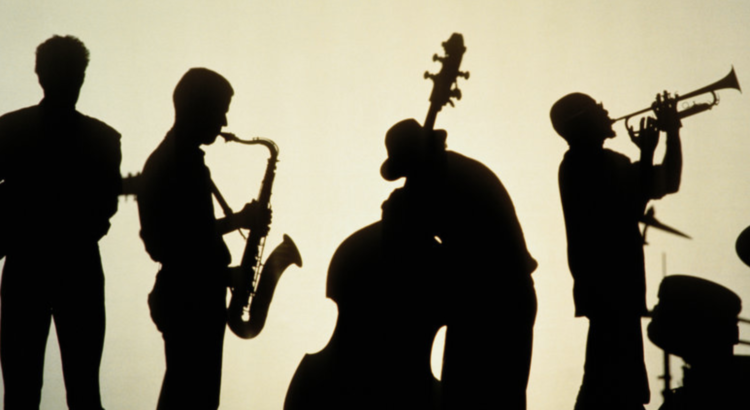 For most of us, quitting the instrument was the highlight of our musical careers. Thank god Jordan Smith is not like most of us.